Cytoviva Hyperspectral Microscopy | EINST Technology Pte Ltd. In addition, CytoViva provides hyperspectral imaging in both wavelength ranges for macro-level samples that do not require microscopy level analysis. Hyperspectral images appear very similar to a traditional optical image with one important difference. When observed via image analysis software, each pixel of a hyperspectral image provides the complete spectral response of that pixel’s spatial area within the VNIR or SWIR spectral range. At 100x magnification, a hyperspectral image may contain as many as 700,000 pixels as small as 128nm each. This spectral data is recorded at approximately 2nm of spectral resolution in the VNIR range, enabling minute spectral differences to be measured from pixel to pixel within the image. Using CytoViva’s proprietary hyperspectral image analysis software, it is possible to identify, locate and map nano-scale materials within a sample based on the unique spectral response of this material. This can be accomplished without any special staining or tagging of the target material, as is often required with traditional microscopy techniques. In addition, when functional groups are added onto or into a nano-scale sample, they can often be identified, as this change in the sample’s surface chemistry will be spectrally detected. The primary components of CytoViva’s Hyperspectral Imaging technology include a transmission diffraction grating spectrograph and an integrated camera. These components are mounted onto the camera (C) mount of the microscope. A hyperspectral image is created in a line scan or “pushbroom” fashion, by moving the sample across the field of view of the microscope and spectrograph via an automated translational microscope stage. Typically these spectral images are created in seconds or minutes, depending on the required exposure. The hyperspectral imaging hardware is integrated with customized image analysis software. This proprietary software provides the ability to compare spectra within a sample image or between images. It can also build a spectral library of unique samples elements. Using this spectral library, these sample elements can then be mapped in subsequent samples. To learn more about the research applications supported by CytoViva’s Hyperspectral Microscopy System, please click on the hyperspectral applications page above. 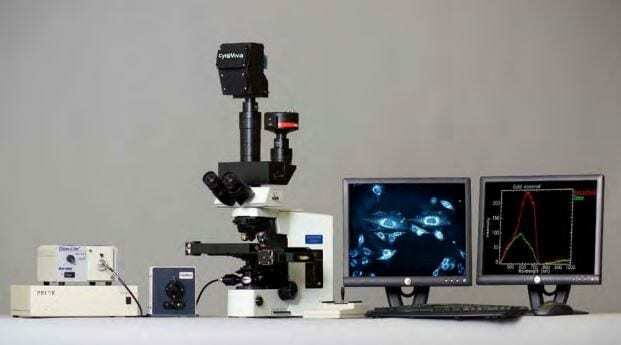 CytoViva’s hyperspectral imaging capability can also support other standard microscope imaging techniques such as reflected light, fluorescence and transmitted light brightfield, as well as, a macro level image analysis platform. For application examples illustrating how researchers around the world are currently using CytoViva’s Hyperspectral Microscopy Technology, please see below.